Prominent manufacturer and exporter of Metal Beads. The metal beads of our company are truly versatile by nature and have enchanting view and beautiful designs. These metal beads have the capacity to captivate the minds of the clients and are available in mesmerizing ranges. Further, these metal beads could be obtained at reasonable prices. We specialize in manufacturing and exporting of metal beads, spacers, heads, pins, hooks, toggles, etc. 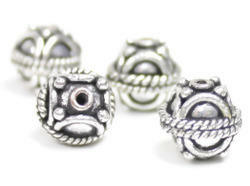 These Silver Beads are helpful in making almost any of the jewelry items. We make silver beads in many designs. These come with hints of golden colour too. They are most popular for using in bracelets or as charms. We export only high quality jewelry with good quality of gems used. Our designs are unique, and our wide range includes pendants, earrings and bracelets that can be mixed and matched. Our jewelry is available in bulk as well. We make Golden Round Beads in many designs, colours and shapes. These come with hints of silver colour too. Our jewelry is available in bulk as well. We specialize in manufacturing and exporting of metal beads, spacers, heads, pins, hooks, toggles, etc. 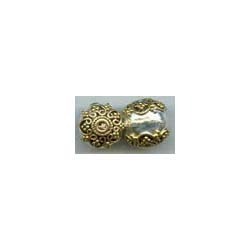 These beads are helpful in making almost any of the jewelry items. They are most popular for using in bracelets. We export only high quality jewelry with good quality of gems used. Our designs are unique, and our wide range includes pendants, earrings and bracelets that can be mixed and matched. Our designs are unique, and our wide range includes pendants, earrings and bracelets that can be mixed and matched. These beads are helpful in making almost any of the jewelry items. We specialize in manufacturing and exporting of Golden Beads Jewelery, spacers, heads, pins, hooks, toggles, etc. We make golden beads in many designs, shapes, colours and sizes. These come with hints of silver colour too. They are most popular for using in bracelets or as charms. We export only high quality jewelry with good quality of gems used. We make Golden Beads in many designs. These come with hints of golden colour too. They are most popular for using in bracelets or as charms, and come in various sizes and shapes. We export only high quality jewelry with good quality of gems used. We specialize in manufacturing and exporting of metal beads, spacers, heads, pins, hooks, toggles, etc. These beads are helpful in making almost any of the jewelry items.Our designs are unique, and our wide range includes pendants, earrings and bracelets that can be mixed and matched. Our jewelry is available in bulk as well. Our Silver Beads Jewelery are unique in quality. They are most popular for using in bracelets or as charms. We export only high quality jewelry with good quality of gems used. Our designs are unique, and our wide range includes pendants, earrings and bracelets that can be mixed and matched. Our company is among the most sought after companies which deal in the manufacturing and exporting of Metal Bead. These metal beads are manufactured at our state of the art center and have beautiful appearance. Comprising of metal beads, spacers, head, Pin, hook, toggles, etc; these metal beads have eye-catching patterns and aesthetic designs. Besides, these metal beads are obtainable at excellent prices.